This is great! I’m starting my first container garden in my first Condo… unfortunately our HOA has strict regulations about what can be sitting outside, so I’ll have to pretty up my containers so they definitely look like “pots” instead of plastic storage boxes. I’m linking to this great post from my blog, eatlocal.wordpress.com, and wondering if it would be OK to use the image above, giving full credit to the artist, of course. Thanks for considering. Yes! Blog on! And thanks for the link. can i feed from the bottom with a nutrient solution? … or do i have to use the fert strip on top? I’ve fed from the bottom and it seems to work. this is just to thank you for your easy tutorial for a DIY self-watering container. Actually, at least in my Town, those containers are way too much expensive to buy! Thank you for your note! I hope you don’t mind if we re-posted your comment and picture today so everyone could see your beautiful SWC and be reminded that they can make them too! Is there any concern of leaching from the materials? Looks like you are using PVC pipe as your tube. I have heard bad things about PVC exposed to the elements breaking down and releasing bad things into soil. Any comments or alternatives would be appreciated. I love reading your blog and thought you might be interested in the fact that I entered a contest for a pet project with Tidy Cats company. My entry was a self watering planted wade with 2 of their containers. Most of the other videos are very plain and typically describe a litter box or other play structure for a cat. A winner gets $10,000 and will be decided within about 30 days. Please let me know if you would like additional info. I’ve heard that PVC pipes release dioxin as they burn and/or deteriorate as a result of the elements. Is this true? What can you suggest as an alternative that won’t poison us? For the watering pipe you can use bamboo, copper or aluminum pipe. I was wondering if you could tell me approximately how many of these containers it would take to feed one single person on a consistent basis throughout the entire spring and summer seasons. Also, do you use dish-soap when you wash your buckets? Thanks for your time and keep up the great work. This is a question for John Jeavons. He’s spent most of his life trying to answer the question of how much space it takes to support a person. He’s assuming your working in the ground and growing your own compost (not an option in SIPs). And, yes, dish soap should be fine. Here’s an article on Jeavons: http://www.motherearthnews.com/organic-gardening/john-jeavons-zmaz80mazraw.aspx. Erik already directed you toward Jeavons. Also, google Green Roof Growers. Our friends in Chicago blog about their rooftop SIP gardens. That should give you a good idea what an advanced set up might look like. I don’t know if anyone checks this anymore, but I had one thing to add regarding the “ugly” factor of plastic bins filling the yard. Make a cheap surround out of pallets. I found this website, which gives pretty good instruction on how to do this. Where I am, you can get pallets for about a dollar, so this makes it easy to make a somewhat attractive wood-based surround for your container garden, cover it all in a little burlap, and it looks like a fancy-pants garden. Hey Ben–thanks for the link. A surround is a great idea. 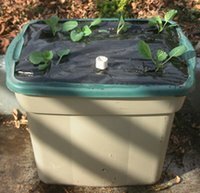 Self-watering containers have an overflow hole, so you can’t overfill the reservoir, and thus you cannot overwater. The plant takes what it needs from the reservoir. 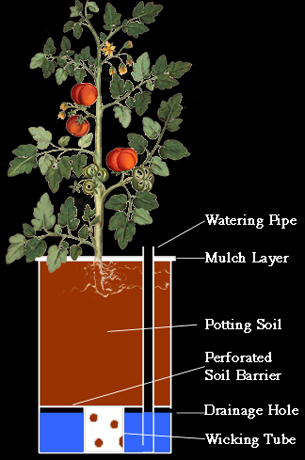 How often you fill the reservoir varies–it depends on the size of the pot, the thirst of the plant, and the weather. I just top it off until I see water starting to flow from the overflow hole.